Why is it that when you mention a station wagon, the first thought that comes to mind is groceries? Who buys enough groceries to fit into an elongated full-size sedan? Well, families of course. Ever tried to feed a teenage boy? If you’re not careful you could lose a finger or two. Having the convenience of a wagon not only makes bringing home the bacon for your children easier (all twelve pounds of it) it also makes carting them around, hauling miscellaneous equipment, and finding enough seating that they don’t have to sit on top of each other easier as well. 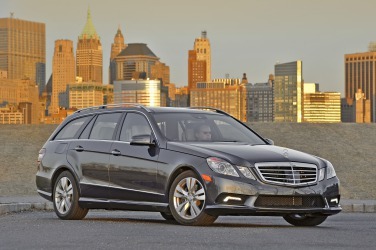 If you’re looking for the best station wagons of 2011 to handle all your spacious needs, we’ve researched top automotive testing at Car and Driver, Consumer Reports, Edmunds, and Motor Trend to bring them to you. The E-Class is a luxury car anybody would want to own in any body style; but the wagon may be the most appealing of all with a generous 57 cubic feet of maximum cargo space and a rear-facing third-row seat commensurate with many old-style wagons from the past. Even with its elongation, it possesses a surprising balance between soft suspension and tight, responsive steering. It can supply a myriad of amenity upgrades, but have your checkbook ready if you plan on going that route, as they can hike up the price in a big way. This is, however, one of the most rewarding luxury cars to drive, period. Though it may not look like your average station wagon, that may be what adds so much appeal to the Kia Soul. It gives owners a surprisingly impressive driving experience, staying planted through tight turns and feeling much lighter than it actually is. Though it is remarkably affordable at the base MSRP, the base 1.6L engine is conversely unremarkable. It may be worth it to up the trim level, despite the $2,000 price hike, and get the 2.0L four-cylinder engine. As a matter of fact, if you want an automatic transmission, you won’t have a choice but to upgrade. The interior displays a nice array of curves and shapes, encompassed by a two-tone color scheme and user-friendly control locations. There aren’t many wagons out there at any price that can match the cargo capacity of the Subaru Outback’s 71.3 cubic feet, let alone wagons that remain in the category of affordable. Its roomy backseat makes a superb option as a family vehicle, and its off-road prowess only enhances its stature in this respect. It’s not as agile as it once was, thanks to Subaru’s yearnings to transform it into more of a crossover SUV than a wagon, but it still remains confident on the road and ride quality is better than ever with an improved suspension. The base 2.5L engine is adequate, but most will want to jump up to the 3.6L flat-6 for the added torque. 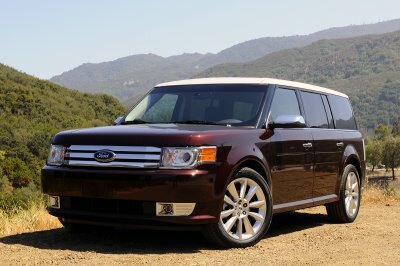 Ford went way out on a limb with the design of the Flex, but it’s paid off with the best alternative to minivans and larger SUVs available. It offers generous space in all three rows, plenty of high-tech features, a turbocharged engine option, and a maximum 83 cubic feet of cargo space. The power-folding mechanism for the second-row seat makes getting to the third-row seat incredibly easy, a feature that should enhance its appeal to parents. The ride is always comfortable and the EcoBoost version of the 3.5L V6 engine supplies a nice little kick in the power area. Ford’s Sync system seems to only improve with age.